Lower The best fishing occurs during the midday. BWO hatches are consistent with the higher temperatures. You might try throwing in some skwala adults and nymphs. Water is being let ... moreout of Deer Creek. Flows are extremely high, ranging from 564 ft3s below Deer Creek to 449 ft3s near Harbor Drive. Look for stoneflies in sizes 10 to 12, and use a BWO dropper for best results. Water temperatures average around 43 degrees. Flows are moving extremely fast, with current levels near 267 ft3s and flows near the Jordanelle release at 305 ft3s. The average at Charleston is flows at or around 286 ft3s. Be cautious of the faster currents. It has been a long winter in the Park City, Utah area, but in the last couple of weeks it seems like spring is getting the best of winter. This is great news for any fisherman that ... moremight be out here for a ski trip and is looking for another activity. The Middle Provo river flowing below Jordanell Reservoir is at winter flows, which is about 150 CFS (cubic feet a second). The midge fishing has finally started to get active in the past week, and there has also been a spotting of some buffalo midge. Nymph fishing has been most productive in the morning. The best rig for nymphing has been a light nymph rig with black or gray Zebra Midge as your point fly and small size 24-26 thread midge (best colors: red, black, olive and tan). 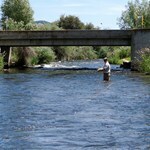 You can look for some good dry fly fishing to start around noon. This time of year it is really important to have a longer leader and lighter tippet. Typically, we have been using a 12 foot leader and 6-7 x tippet. The flows below Deer Creek Reservoir (the lower Provo River) have also continued to flow at their winter flows which is about 100 CFS. There has been consistent dry fly fishing in the morning with midge clustering on the surface. For the morning dry fly fishing, I have been fishing a tandem rig using a Quiggly Hackle Stacker as my point fly and small size 22 Mother Sucker trailing about 18 inches behind the hackle stacker. 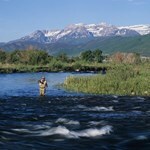 Once the sun hits the water, the dry fly fishing in the morning slows down. Not to worry the nymph fishing continues to be solid for the rest of the day. 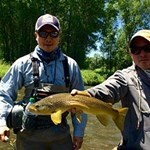 With the low flows, I have continued to have success with that lighter, in-line rig. This year they seem to prefer a larger sow bug in a size 14-16, with a small olive midge emerger size 24-22 trailing behind it. 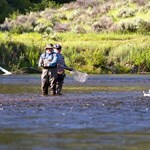 In the last Couple of weeks, the fishing on the Middle Provo River has been good to great. The Buffalo midges on the Middle Provo river hit their peak a couple of weeks ago and the ... morehatch is starting to slow down. Not to worry, the Blue Winged Olive hatch on the Middle Provo River is just getting started and should make for some excellent fly fishing in the coming weeks. In the morning, we are still nymphing with a light weight bounce or in-line rig. For nymph fishing, our best flies for the Middle Provo River are size 22-24 thread midge in colors: red, black, grey, brown, and olive. In the afternoon, as the Buffalo midge hatch and the Blue Winged Olive hatch get going, I am switching over from nymph patterns to some bigger offerings. Best nymph patterns in the afternoon on the Middle Provo River have been a size 16-18 black Zebra Midge, 18-20 Grey RS2 and 18-20 black WD-40. 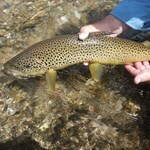 The dry fly fishing on the Middle Provo River is excellent in the afternoon. 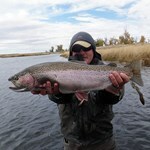 I have had the most success fishing an 11 foot leader with 6-7x tippet. My most productive fly combination is a size 18, black or brown, Mother Shucker dry fly with a size 20 Noseeum Blue Winged Olive or comparadun trailed behind it. The Lower Provo River is in excellent condition for any of you anglers looking to take a break from the Middle Provo River. You’ll have a chance at catching a fish in the 20-inch range or better. The morning bite has been very consistent with an excellent midge hatch. 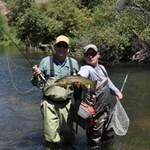 The last couple of guide trips I have had on the Lower Provo River has been all dry fly fishing. The rig I have had the most success with has been a 12 foot leader with a size 18 cluster midge pattern, with a size 18 comparadun Blue Winged Olive trailed behind it. Anyone looking to just nymph fish, try to find some deeper pools. The fish seem to be very spooky with such low water flows. The best patterns for nymph fishing have been a size 16-18 sow bug as your point fly and a Blue Winged Olive nymph trailing behind it. 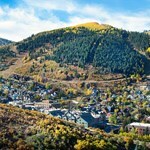 If you are visiting Park City, Utah and looking for an outdoor activity, it might be a surprise to you that the ski resorts are already closed. 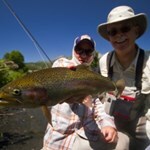 Not to worry, spring provides some of ... morethe best fly fishing Park City has to offer. The Middle Provo River is still flowing around 150 CFS ( cubic feet per second). The flows on the Middle Provo River should start to increase in flow the next few weeks as we get ready for spring run-off. 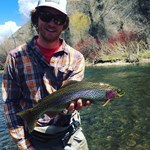 The best fishing on the Middle Provo River has been in the afternoon. The Blue Winged Olive hatch starts around noon and goes for 2-4 hours depending on the day. 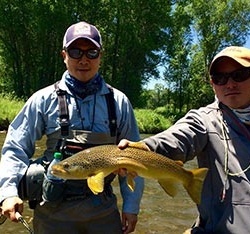 For nymphing, Park City Fly Fishing Company guides are having the best success on a 4-6 foot rig with 6x tippet. We are using a Blue Winged Olive nymph like a Barr’s emerger in size 20-22 as our point fly and 22-24 thread midge trailed behind it. 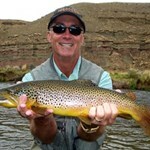 The best dry fly fishing is on overcast days. Keep in mind that the hatch usually takes a little longer in the day to get going when it’s not sunny out. The flows on the Lower Provo River have come up about 60 CFS in the last week. 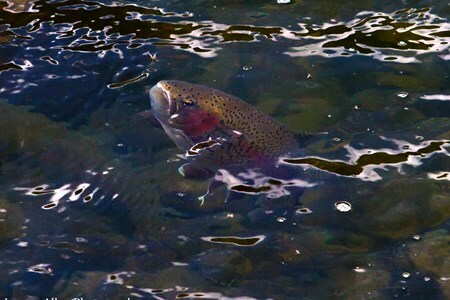 The increase in flows have made fish become more active, feeding on sow bugs and other crustaceans. The flows have also opened up more water to fish as well. 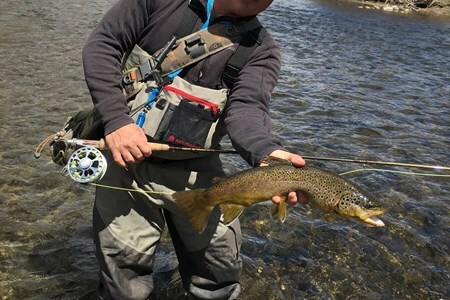 With the increased water flows, we are spending more time on the Lower Provo River than anywhere else simply because it has made the fishing the best around. The dry fly fishing has suffered a little bit with the water flow increasing, but the nymph fishing has more than made up for it. We are fishing a double sow bug rig with a size 14-16 sow bug as our point fly and a size 20-22 sow bug trailed behind it. The fishing in the shallows has been excellent. If you shorten your nymph rig and stay close to the bank, you should have an excellent day fly fishing. 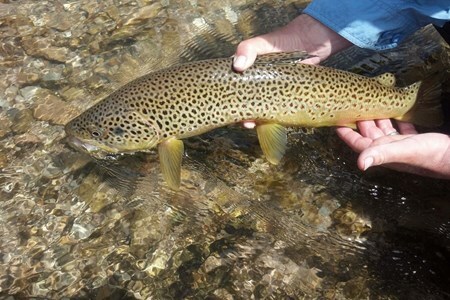 Utah fly fishing in the springtime can produce some of the most exciting fishing opportunities of the year. 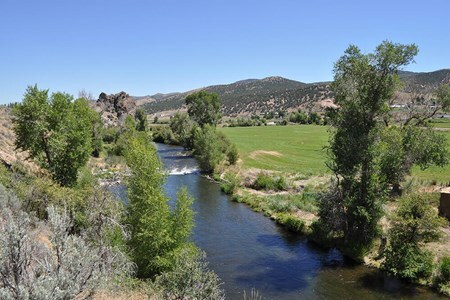 As the weather gets warmer and winter snow pack starts to melt, we start ... moreto see the rivers in the Park City area increase in water flows or CFS (Cubic Feet per Second). 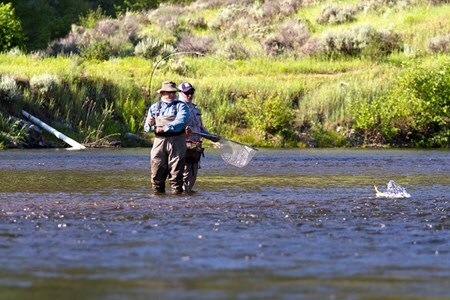 Many anglers think that when the bigger water rises that the Utah fly fishing is done until summer but that couldn’t be further from the truth. 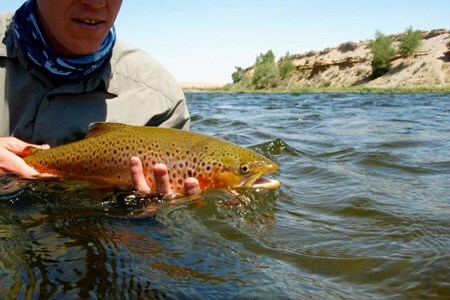 In fact, spring is some of the most productive times to fish the Provo River, Weber River and other remote streams in Utah and Wyoming. Most of our streams in and around Park City are known as tail-waters (water comes from a dam), which means they are controlled flows. Unlike free-stone streams where the water is directly effected from natural snow pack, tail-waters tend to be less effected by spring time run-off and are more productive with higher flows. When the water starts to rise, tons of trout food like sow bugs, scuds, worms, stoneflies and mayfly nymphs get dislodged from the rocks and it sets up a feeding frenzy for the trout. I want to share a few tips for fishing the higher water in the spring time. As the water increases in flows, the trout get pushed to the edges of the river. With the stronger current, the fish don’t have the sustained strength to stay in the middle of the river and feed. 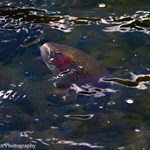 It is really important as an angler to stay on the bank or close to the bank and fish the inside edges of the river. Surprisingly, you’ll want to fish a shorter nymph rig, about 5-7 feet, now that the fish are pushed into the shallows. This time of year, it is always a good idea to check the water flows before you get out to the river. One thing to keep in mind is that it might not always be safe to cross the river with the higher flows. Please exercise caution, and approach the stream wisely. 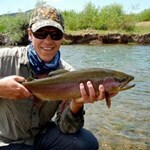 For more information on fishing in the spring check out my seasons page. 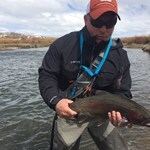 With twelve years experience of guiding fly fishing on the Provo River and surrounding streams, Jeff Harwin is one of the most respected guides in Utah. Jeff began fishing in Florida ... moreas a young child and was first introduced to fly fishing while working as a camp counselor in Pennsylvania at the age of sixteen. Soon he began chasing tarpon and snook on a fly rod, and never picked up his spinning rod again. 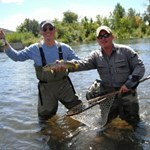 Jeff has been a die hard enthusiast ever since, chasing trout on the Provo River and other local streams. 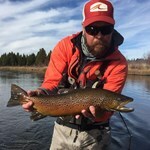 If you go on a guided fly fishing trip with Jeff you might find yourself on one of many Utah’s secret screams throwing large dries to huge trout. His knowledge of the sport, attention to detail and preparation for any guided trip guarantees a successful excursion. 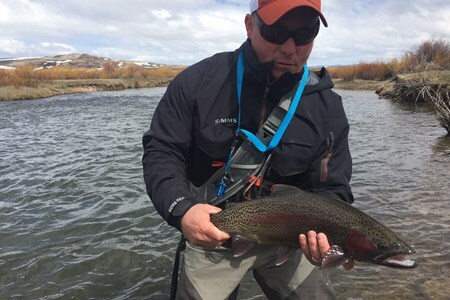 Jeff takes pride in hand tying all of his flies for his guided fly fishing trips, and is ready to share his enthusiasm for the sport with novice to expert anglers. 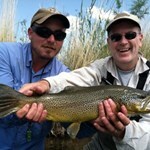 Let Jeff make your Utah fly fishing trip unforgettable. Jake has been guiding on the Provo River and surrounding streams for the past 11 years. 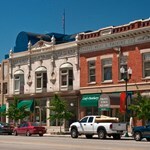 Averaging around 180 guide days a year, Jake Smith is considered by many the hardest working ... moreguide in Park City. 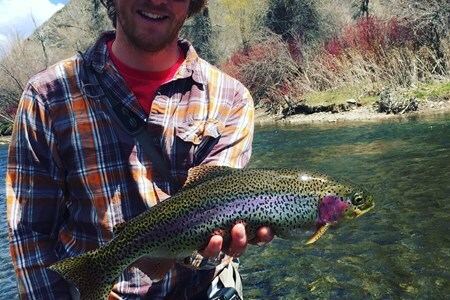 Jake’s passion for fly fishing started by spending all his free time in the Uinta’s fishing the small streams and lakes with a fly. 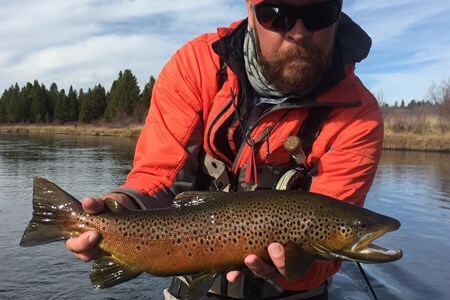 When a friend took him fishing to Idaho he knew he found his life pursuit Now you can find him in many of the western states chasing a varied species of fish from trout to warm water species. 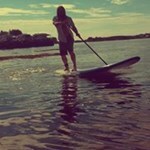 He loves the sport and considers it a privilege to guide all the great people he meets. He prides himself on working hard to get his clients on fish and helping them understand how to catch and land big fish. 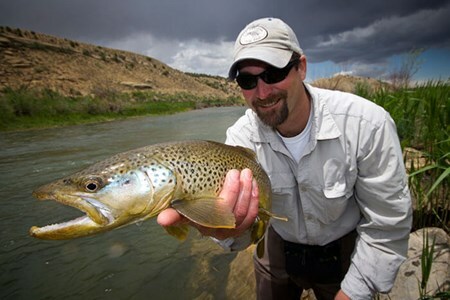 Jeremy Allan has been fly fishing in Utah for the past 25 years and has spent the last 11 years guiding on the Provo River and surrounding streams. Not only is Jeremy considered one ... moreof the top fly fishing guides in the area, he is also an accomplished photographer. His work as a photographer has been published in magazines such as The Drake, Northwest/Southwest Fly Fishing and Catch Magazine. Jeremy takes his artistic talents to the vise, and uses his creative fly tying skills to dupe the most finicky trout. Spending a day on the water with Jeremy will not only improve your technical skill, but you will also put a lot of fish to the net. 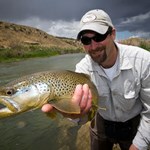 Grey has been guiding professionally for the past six years and fly fishing for over a decade. He has acquired a true passion for guiding over the years and is an avid fly tyer. Grey ... morelearned to fly fish in the salt water of the Puget Sound and the rivers of Washington State. 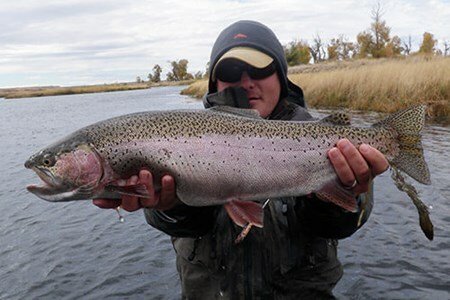 After moving to Utah, he became consumed with chasing brown, rainbow, and cutthroat trout on the waters of Utah and Wyoming. 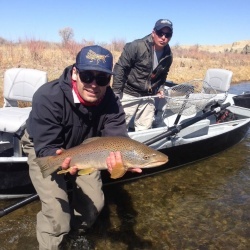 Grey loves casting to wild trout from his boat with dry flies and says, “helping my clients achieve this same thrill is why I love guiding.” Grey’s easy going demeanor, humor and skill set will give you an unforgettable fishing experience. Just a few hours’ drive from the acclaimed Mecca of fly fishing, Utah is an often-overlooked goldmine for serious fly anglers. Abounding with wild rivers and striking scenery, it’s ... morea paradise for solitude seekers and nature lovers.